It's Okay to Think It: Responding to Twin Comments | How Do You Do It? Most days, I recognize that when some asks me “Are they twins?”, they really mean, “I see you have twins, but I don’t want to jump to any conclusions. You might have just have a kid with a growth problem. 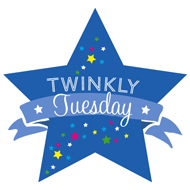 I would like to open a conversation on the subject of (your) twins, so let me make sure that they are twins.” Then there are the days when I have been chocolate-deprived or sleep-deprived or my children are 3 years old or I am generally grumpy. On those days, don’t ask me these questions. On days of the Sadia grumpies, here is what happens when talking to people I will generally label as Nice Person at the Grocery Store (NPGS). Sadia’s internal monologue: Yes. The ultrasound said so. You see, they shared an outer sac, but not an inner sac, and that’s how we know. They’re “identical” only in the genetic sense. I wish I could get people to use the term “monozygotic”. That means they came from a single zygote, a single fertilized egg. It’s most fascinating to study how different monozygotic twins really are. You really should have asked if they were monozygotic. Look at ’em! They don’t look the same, so clearly they’re not “identical”! They could have been dizygotic twins, and still looked all kinds of similar. “Dizygotic” would have been what you meant if you’d said “fraternal”. There is no such thing as a “paternal” twin, so it’s a good thing you didn’t say that. Sadia’s internal monologue: Now why would I need to do that? Sadia’s internal monologue: I just told you they were monozygotic! Fine, there’s that one set of twins that’s monozygotic but different genders; I saw them on National Geographic. These are not they. Sadia’s internal monologue: How is that relevant? The whole age rank typecasting thing just doesn’t apply. They’re two minutes apart. They’re both bossy, if that’s what you’re asking. The doctor yanked J out first. Sadia’s internal monologue: Why would I want my hands empty? Sadia’s internal monologue: Are you really truly asking a stranger about her reproductive system? Really? You’re asking me whether their father and I had trouble conceiving? How is that any of your business? 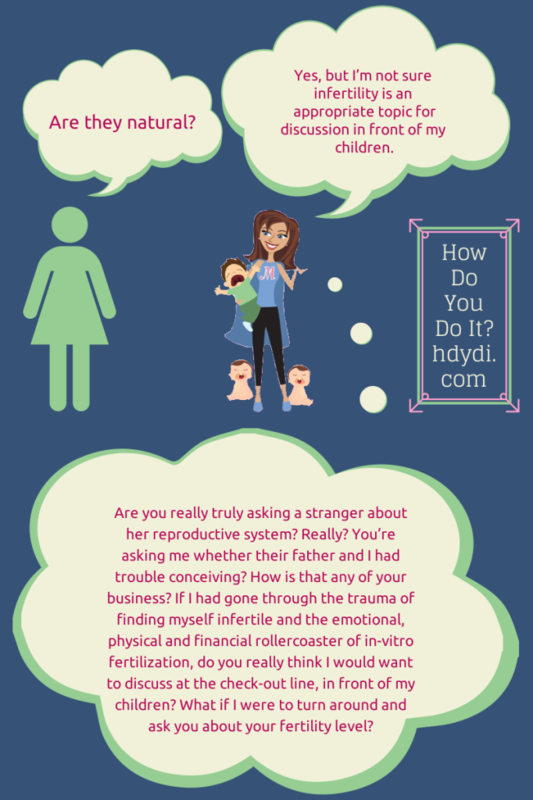 If I had gone through the trauma of finding myself infertile and the emotional, physical and financial rollercoaster of in-vitro fertilization, do you really think I would want to discuss at the check-out line, in front of my children? What if I were to turn around and ask you about your fertility level? Some people! Sadia’s internal monologue: Of course they run. In fact, they’re running right now. They jump too. And dance. Oh, there they go, skipping again. Someone’s going to get hurt. Sadia’s internal monologue: No, kidding, with that attitude. I really hope you don’t have kids of your own. Your resentment of children is kind of obvious. Sadia’s internal monologue: You did NOT just say that in front of my children! Sadia: Leave as quickly as possible. Sadia’s internal monologue: Pretty darn well, thank you very much. Sadia’s internal monologue: PRIVATE. PRIVATE. PRIVATE. Sadia’s internal monologue: Huh? How, precisely, would I do that? Loved this and can totally relate. I have to prevent myself from an eye roll every time someone asks me if our Girl/Boy twins are identical. 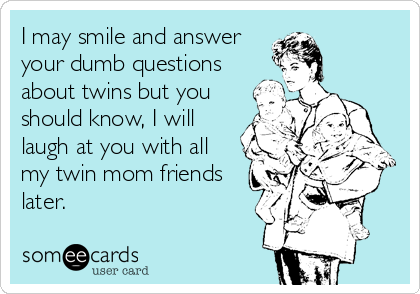 I’m always wary of staring strangers when I’m out with the twins because of anticipating the stupid questions they are bound to start asking. It’s much better when Chinese people exclaim that we are so lucky for our Dragon Phoenix twins and leave it at that! This made me laugh!! I remember as a little kid people asking these questions to my mom. The one my sis and I get a lot now that we’re adults is “What’s it like to be a twin?” Our response; “What’s it like not to be?” DUH!! Just found your blog and can’t wait to read more!! Haha! My boys are only 3 months old and this still had me cracking up. Pingback: Monday MoM Blog Picks - How Do You Do It? You hit the nail on the head! “Monozygotic” is my response and the reaction I get is a look of supreme dumbfounded-ness, which makes my ‘inner monologue’ a satisfied smirk! Lol! Pingback: Again with the "You're Not Identical" - How Do You Do It?